Riot police, with faces masked, pelt peaceful protesters with stones. A refugee in t-shirt and shorts slides down a loose scree slope and places his hands upon his head, only for the police to fall upon him and batter him with boots and batons. Another protester, already handcuffed, is kicked to the ground by a mob of police. In Moria prison camp and across Lesvos, the same border regime which condemns the alleged “barbarism” of refugees is lashing out with medieval brutality. 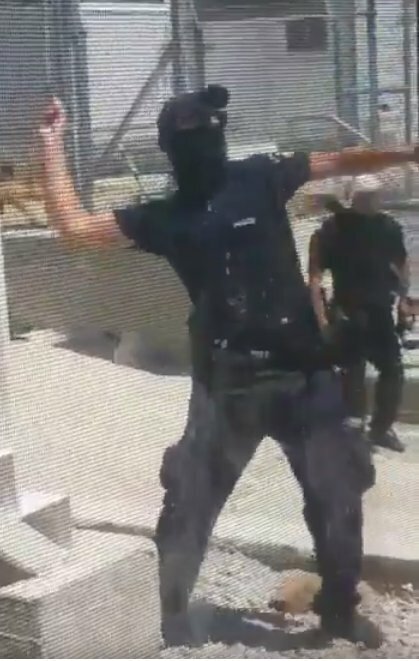 Image: Screenshot of a cop throwing a stone against refugees in the Moria camp in Lesvos, Greece at July 18th. Originally published by No Border Kitchen Lesvos. Yet police violence is only the bluntest weapon used by the EU and the Greek authorities as they exercise arbitrary power over the lives of our refugee friends. Even more than the refugee left unconscious and bleeding for four hours after a police beating, the brave human rights activists currently on hunger strike inside and out of Moria embody the maltreatment of refugees on Lesvos. The hunger strikers slowly starve, denied access to basic medical care and shading closer to death on a daily basis. Likewise, refugees trapped on Lesvos to rot for 12 months or more are seeing conditions and care provision deteriorate week by week. The only question is whether an epidemic of self-harm and suicide bids will claim them before they fall victim to frequent and brutal waves of deportation. The assaults – bravely captured on camera by refugee activists inside Moria – clearly depict the way the EU is abusing these vulnerable individuals. Following protests against the lack of action on the cases of refugees from certain countries, riot police forced the demonstrators inside the camp and closed the gates. Several new squads of riot police have been freshly imported from Athens, to crack down on dissent and round up refugees for deportation. They roamed through the camp alongside their compatriots from Lesvos, arresting at random anyone who seemed to share the protesters’ ethnic background. Covering their faces to avoid identification, they wielded rocks and batons and fired teargas canisters at point-blank range. Victims were spat upon, subjected to racist abuse (such as “Stupid African”), stamped on by groups of ten or more cops, and beaten inside the police station. Some were dragged out of the boxes where they sleep, having remained inside for the duration of the protest, beaten and arrested. Pregnant women were manhandled. You can read more testimonies here. One victim lost consciousness after the assaults, waking up four hours later in hospital in critical condition. He was bodily dragged to the prison van by police, leaving him with wounds all over his body. Others spent up to six days in jail awaiting pre-trial hearing without access to a doctor. A comrade newly arrived to the island said the sight of the ‘suspects’ arriving to court, splattered in blood and still with open wounds, could only be compared to centuries-old woodcuts depicting the victims of slave traders. Lawyers were likewise repeatedly denied access to the 35 arrestees. The majority have already been dispersed in handcuffs and tattered clothes to prisons all over Greece, to languish for a year or more until their case is heard – given the near-total lack of evidence against them, the prosecutors are likely to delay their trials for as long as possible. On top of their ongoing asylum claims, they now face a minimum of €1300 each in legal fees, compounded by long-term isolation from their friends and family – and from their lawyers. We are working with Greek comrades to build a legal and financial solidarity network and will let you know how you can help the ‘Lesvos 35’ soon. We stood in solidarity with them outside the courthouse and will not let them be forgotten. Sadly, it is not only the cops leaving refugees broken and bleeding. Since the EU-Turkey deal was signed in March 2016, reported instances of self-harm in Moria have increased by 600 per cent, while there have been at least 10 suicide attempts within the camp in recent months – as always, actual figures are likely far higher. You cannot walk down the street in Mytilene without passing young men in ill-fitting hand-me-down clothes, riding up to expose limbs scored with fresh knife wounds and cigarette burns. A recent report by Médecins Sans Frontières found that 80 per cent of refugees assessed in Moria had “severe” mental health issues. One-fifth had been tortured, two-thirds had suffered violence, and half of all women in Moria examined by a gynecologist had suffered sexual violence. Yet there has been a “dramatic deterioration” in the provision of mental health care, as a “grossly deficient” system aims only to deport refugees wholesale back to Turkey without concern for their wellbeing. Yet still refugees arrive on Lesvos – nearly 1000 in the last fortnight alone. Just two days ago, five women and two children drowned attempting to cross the Aegean. 2377 refugees have lost their lives crossing to Europe this year alone. 1 in 50 people now dies while making the crossing – it is far more dangerous than back in 2015, when the world was still watching. This figure still does not include those thousands who die crossing the Sahara or at the hands of people smugglers in Libya, where deaths are likely even more commonplace than out at sea. Meanwhile, more and more of our friends are being deported back to face violence, persecution and death abroad. This Monday, police stormed Moria and nearby squats and social centres, arbitrarily arresting 50 refugees. They were forced to release those whose case is still under appeal: around 25 others, less fortunate, joined the ranks of those awaiting deportation. Stripped of their phone, cash, and everything bar the clothes they stand up in, handcuffed deportees are muscled onto boats surrounded by Frontex minders and returned to Turkey – a “safe country” where journalists, teachers and judges are being imprisoned and brutalised in their thousands. They face 6 months’ internment, in overcrowded prisons where sexual and physical violence are commonplace and those without friends or financial support can easily sink without a trace. By this stage lawyers can do very little, as far as we know securing protection for only 5 out of thousands of non-Syrian refugees in Turkey. Others face direct deportation to their countries of origin, where the situation is often even bleaker. Many of our friends are now too scared to attend medical appointments or crucial case hearings, for fear they will be seized and deported. They may never see their friends and family here again. The mental health epidemic, and the generalised terror across the island , must be understood as weapons in the hands of the EU and the Greek authorities. They are breaking down people’s will to struggle and fight for their human rights, coercing vulnerable individuals to return “voluntarily” to unsafe countries. The regime is building borders in the heads of refugees. We continue to provide food to hundreds of refugees across the island, and have a waiting list of at least 200 more individuals who urgently need our help. Our political programmes also continue, providing direct, legal and personal support to those imprisoned and at risk of deportation. We are looking for one-off or regular donations, solidarity events abroad, and long-term volunteers to come to the island. With this support, we can give these individuals the best chance possible of freedom and security, as well as feeding hundreds more refugees – please contact if you would like to support our work. The EU is murdering refugees. It is condemning them to drown in the Aegean, to starve to death in prison camps, to open their wrists with razor blades, to be raped and beaten in Turkish prisons, to be tortured and executed in the countries they fled. Their blood is on all our hands. We remember those who have died, and fight for those whose struggle continues. Next post: #RefugeesGR & Balkan Route: Solidarity not Charity! #Lampedusa: Repression Against Life-Savers | Enough is Enough!